Having a shower is so much quicker and more convenient when life is busy enough, but it can be a little awkward when it comes to taking care of your feet and legs. Balancing while standing under running water to shave, exfoliate or just clean can be quite difficult at times, and not particularly safe, but ElevEase will help to eliminate your issues. 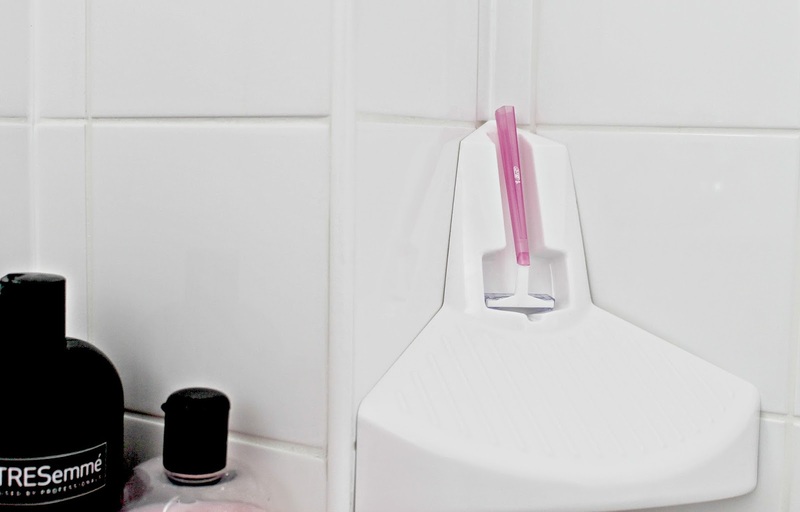 ElevEase is a foot rest designed to fit in the corner of your shower enabling you to rest a foot on it at a time while you get on with sorting whichever body parts need attention. It even has a holder for your razor so there is always one to hand - something that I quite often forget to take in with me! completely before use. There are easy to follow instructions supplied, which include images, so it's really simple to fit. You ensure the surface is clean and dry then measure 50cm from the ground or to your knee height, whichever is best for you, before applying the adhesive and holding it in position for three minutes. It's great for anyone suffering with mobility problems, arthritis or a bad back as it minimises bending. It's also great when a baby bump prevents you from getting to your feet easily too! I've discovered that it's not only great for when the shower is on but it's useful when the shower is off. You can use it to help when painting your nails, when applying tanning products and moisturisers or even as a soap dish and pretend springboard for the kids toys (the Mini Mes often place figures on it during water play). They are available in white and chrome to fit in with your bathroom decor as best as possible - I opted for white to match my suite and tiles. I did worry that it wouldn't be strong enough to support my weight and may fall off but it has been fine so far. Once fitted it feels quite sturdy and it's also really easy to clean with a cloth. It's a handy gadget to have. For your chance to win an ElevEase of your own you can enter via the Gleam entry form below. The giveaway ends at 11.59pm (GMT) 18th August 2014. Leaving a comment is mandatory but there are bonus entries available also. Champneys Spa Treatments Citrus Blush Shower Gel 200ml. Nivea shower gel. It's one of the few shower products that doesn't make me itchy! Philosophy Field of Flowers shower gel. shower gel - any shower gel - I have a bit of a fetish for shower gel! at one point I had 16 bottles!